The context of the representative Königsplatz a modest secret center of another kind is added. A small water level, an art made puddle should be for the period of the art project made in the Propylaea, kept and maintained. It should reflect on that place, the environment and create new looks. With a liquid mirror of standing water, the urban gestures at this location is a thoughtful and critical look will be compared. The resting puddle embodies the alternative world for the monumental and sees the "Outstanding" to reflective. 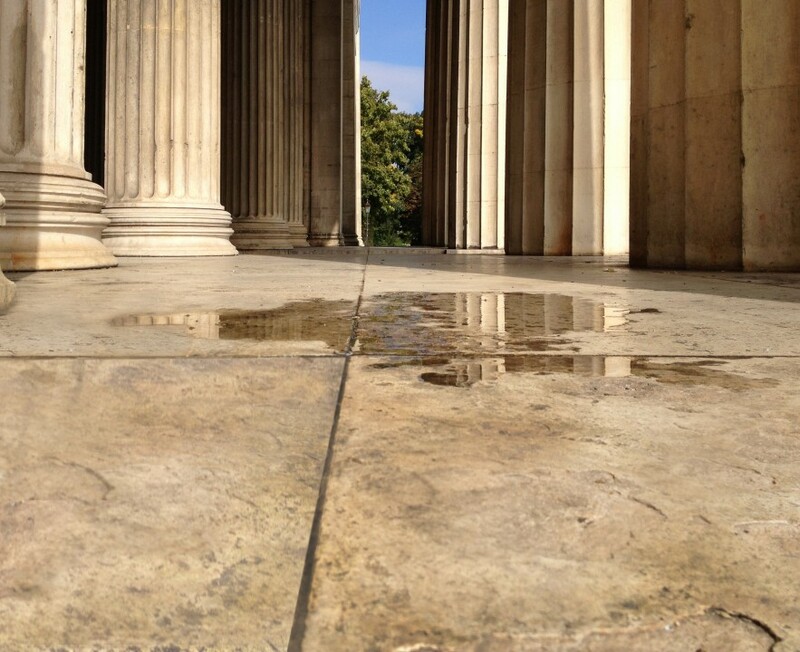 The puddle is thinking clearly about the columns of the Propylaea for pathos and discovered after some time that she is exposed to the force of gravity, while the "solemn" just interpreted differently. Your water is gravity adds completely. In quiet "serenity" it shows what is built on it. "Still Waters" are also very low because they reflect the high in their depth. The "beautiful" puddle is ignorant of the effect of the conscious, the solemn, the effect-free pool results of gravity and looks cheerful and happy in the knowledge level. 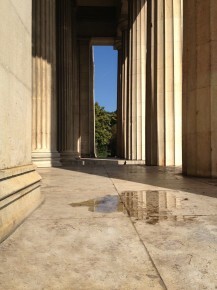 This project forms the puddle a slightly gerücktes from the center of symmetry in the Propylaea. Perhaps as the pineal gland, which had been seen as a single asymmetric phenomenon in the human brain, so as the seat of the soul. Dancing from the axis, claimed the puddle their specificity. The sideways forces fleeing interpret the entire new urban environment. The roundabout at King's Square, all the action in and around the Propylaea. The "eternal" Acropolis ensemble by Karl von Fischer, the permanent collections of museums and the Royal Palace and the golden splendor of the new building of the Lenbachhaus be "transitory" state of aggregation of these "puddles soul" comments and perspective. The investigation into the Propylaea protection homeless, many tourists in this place are part of the classical ensembles and rub visible: the wind drives discarded paper and plastic waste by the Propylaea. All this thinking the puddle. So that they can do without interruption and is seen here, they must re-established itself daily and its surroundings are cleaned continuously. All this must happen in order for her fragile, fleeting existence is not jeopardized. Your existential interest in clean and dry environment should not affect the deteriorating anyway precarious situation of homeless people in this place, but they include, so they want. The puddle as such introduces the question of value, is the question of the intrinsic value (1.5 liters of still water) and to social values. The large public appreciates a puddle not as sculptural performance, rather than the "last" and if it is to do with an art budget, it is for most scandalous. The scale is the public outcry, it is accepted and discussed deliberately, because this outrage is based on the confusion between art and everyday rules, so the content is part of the project. For me as a sculptor, the puddle is a sculptural setting, with the minimum of materials poses great aesthetic and social issues. In Veröffentlchungssinne has the semantic lightweight "puddle" now be given at all levels of weight. The appearance and the promotion of water puddle in a public art competition and the fact-based recommendation for attention she is just as necessary as the day-to-clean base in the Propylaea. Both the competition format and the daily cleaning of the immediate surroundings are mounts of showing and highlighting. These mats protect the ephemeral and "worthless" a "puddle" from being overlooked as a pure everyday phenomenon are to where they get it in the "marked space" of art. It must be, because it shows the potential of social boundaries and drawings are needed weight. The all-powerful and effective certain successes in the study of repäsentativen lion figures, powerful symmetry and obelisks - as part of City Tourism - work well and satisfy even without contemporary art. However undermines the puddle consciously known before the principle of success and therefore popular looks and takes place outside of symmetry, stone, urban development and city marketing selbstgewissem. Alone has the puddle no common media form and therefore needs a "Guided Tour" of its own kind Therein lies the challenge of communicating. In the current, contemporary art, prestige, and money generated far too much of our attention. Also opposed the puddle would make a difference.